Click on YELP LOGO to view our Reviews! 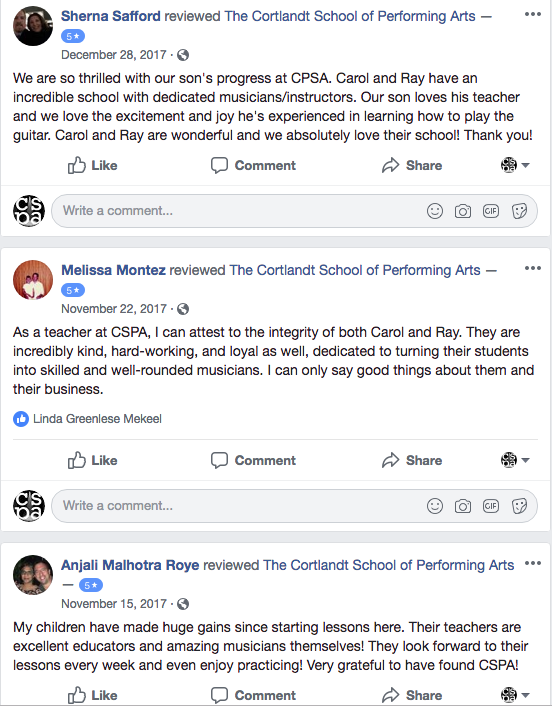 The Cortlandt School of Performing Arts is a very important center in our community that services all age groups with a variety of interests in the performing arts field. We are fortunate to have Ray and Carol Arrucci, the owners of this Arts Center, in Cortlandt and hope that they will remain here for many years to come. I also want to congratulate their staff who are excellent, as well. CSPA is a place where everyone of all ages can express, discover & experience the power of music. It's programming and outreach really make them a vital center in our community. Carol called me one day and asked if she could, in any way, help the Hope for Youth Foundation. I suggested she could provide some music for us when we held fund raising events. Since that time, Carol has been entertaining donors with phenomenal music, free of charge. Ray and Carol are terrific people. They care greatly about The Cortlandt School of Performing Arts and they care greatly about their community. Please support them. They work hard to make a difference. Jim Witt- WHUD Weatherman and the President of the Hope for Youth Foundation. Thank you for such a strong contribution to the publication. The Cortlandt School of Performing Arts is a wonderful gift to our community, offering music lessons in all instruments. Their teachers are world class, and they give multiple opportunities for their students to perform. Carol and Ray Arrucci, who with total commitment own and manage the CSPA, are full of original, creative ideas which they put into practice to expand youth music in the Hudson Valley. Music education is an invaluable tool in a student's childhood, giving them life skills empowerment: confidence, motivation, responsibility, identity, self expression and relaxation. Music bridges all social barriers, and has the ability to unite our entire community.